In the process I was hoping to purchase an invitation to the VIP Experience with Hank Aaron in Atlanta. Meeting Mr. Aaron and getting an autograph from him in person would have been a thrill. I was budgeting the trip based on last year’s prices when invites could be easily obtained for around $2,000. This year proved out of the question as invites were too hard to find and selling for around $4,500. They were gone almost as soon as they were listed. 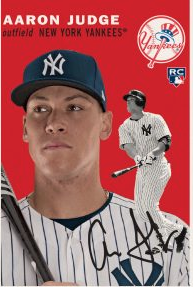 Close to the RSVP deadline Topps announced they would be giving out an 87 card set of Topps History Aaron Judge Cards #/87 based on the 1/1 Autographs found in Transcendent cases. That’s when it clicked for me that if I could find a last minute invite, I could sell off the Judge set after the party to fund part of the trip. As a huge Yankees fan this had me conflicted, but I was willing to do it to make the trip happen. After all, my motivation was to meet Mr. Aaron and get his autograph. But how much of my trip would that set cover? What would that set be worth? I started looking at sales of the Kris Bryant cards around the time of the party last year. I looked at his base card from 2016 Transcendent and his cards that were given out at the Transcendent Party to see if I could find some comps which could help me place a value. At this time last year, which would put it in a comparable time frame with sales for this year, the Kris Bryant Party cards were selling for $55 to $100 a card. The 2016 Topps Transcendent Kris Bryant base cards were selling for between $108 to $150 a card. If you percentage that out, that means a worst case scenario of the party cards were holding 30% of the value of the base with best case scenario being 92% of the base. That’s entirely too big of a swing to effectively place a value, but if you start to use the averages of 48% to 67% of value, that starts to become closer to the actual sales numbers. At 48% of value of the base card you are looking at $51.84 for a Party card on the low end. At 67% value it’s $100.50 a card high end, which tracks eBay sales nicely. What does this mean for this year’s set. 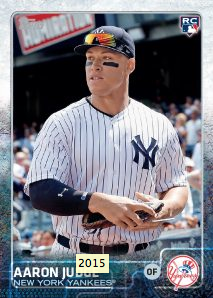 Looking at what Aaron Judge’s base cards from this year’s Transcendent are going for reconfirmed the true magnitude of what Aaron Judge has meant to collecting baseball cards in 2017. The sales for his Transcendent base cards are ranging from $305 to $445. That’s not a typo. That's about 3 times what collectors were paying for Bryant’s base cards. 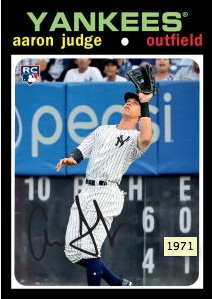 In certain instances, Judge’s base cards are selling for more than his autograph cards. Applying the same percentages used for Bryant allows me to predict Judge's Party cards could sell for between $146.40 on the low end to $298.15 on the high end. And the beauty of this set is there are 22 more cards than last year, 87 Judge cards vs. 65 Bryant cards. Averaging out the cards makes it entirely possible this set could be valued as high as $19,337.93, maybe even more for first to market. Perhaps this is why invitations were so hard to get. 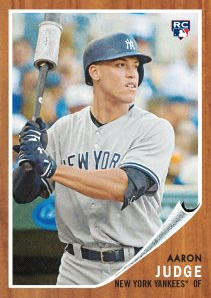 If you are in the market for the Judge Party cards and see them listed as Buy It Now for less than $140 a card for a common year, or less than $300 for the marquee years, you might want to grab them. Someone is leaving money on the table to move them, or doesn’t understand their true value. Same goes for a complete set like these. (follow the link) Anything under a worst case scenario of $12,700 could be a bargain if these take off. Either way I will be following sales closely. A Judge Party Card tracker may be in order. 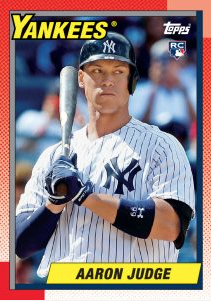 And one last thing to remember, These will be the last official RC rookie cards released for Judge. Justin Verlander on the mound, Babe Ruth at bat. That’s how some are describing incoming Japanese sensation Shohei Ohtani. Many MLB teams fought to get the 23 year old, but the Los Angeles Angels won the battle. He is sure to become one of the hottest rookies of the season and collectors will be looking for his cards as soon as possible, but they won’t have to wait long. Topps has signed Ohtani to a trading card and long-term autograph deal for the upcoming MLB season. 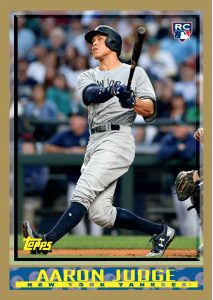 Topps already issued an Ohtani card in the Target Exclusive 2017 Bowman Chrome Mega Box and a 2017 Topps Now card on December 14th that had a print run of 17,323 cards. If you missed either of those and still want one, you can follow this link to try to pick one up. His first pack-pulled trading card will appear in late spring, just in time for Ohtani to join the Los Angeles Angels in Spring Training. His cards will be featured in Topps products throughout the year, including autographed cards. The Angels are already hinting they might use Ohtani in a six player pitching rotation and move Albert Pujols back to first to open up the DH position to allow Shohei to bat on his days off the mound. If he produces in the way he has in Japan, 624 strikeouts in 543 career innings and a batting average of .322 with 30 home runs and 98 RBI in 169 games, Ohtani will have some of the most highly coveted baseball cards and collectibles on the market in 2018. 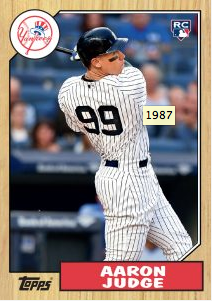 Topps will be the only company to produce his officially licensed MLB trading cards. If you haven't already, you can follow Topps on Twitter (@topps), Instagram (@topps) and Facebook (@topps) for the latest updates and see the first images of Ohtani’s rookie cards. We will be sure to share them too here on the site when they become available. Here is our video box break of 2017 Bowman Chrome Minis. Our 3 refractor packs contained some nice cards and one outstanding rookie refractor pull. 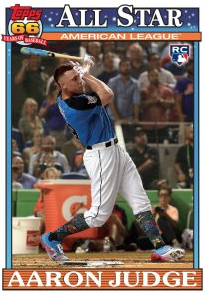 To find available 2017 Bowman Chrome Mini make sure to follow this link.